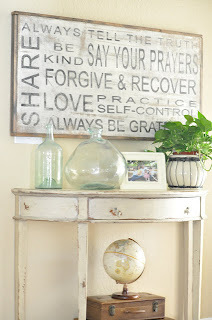 Covenant Relationships: "Family Rules" signs, What Would Have on Yours? 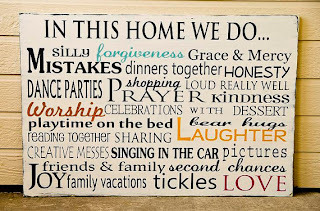 "Family Rules" signs, What Would Have on Yours? "Family Rules" signs seem to have become all the rage. I came across one in my brother's house (his wife is very interior savvy) it says "In this house we Love we Forgive ..." I don't remember the rest but its really very nice. So I started looking out for one for our new apartment, you know, to make it more intimate- I came across loads of them: Say thank you, Always pray, Pay with hugs and kisses, Find beauty everywhere, Dream big and so many others- a testament to all of the things we often never quite live up to but wish we would. I have chosen to make a customised set of rules that applies to our family. You know, with my favourite verses and some other pertinent rules and, " Laugh often and SMILE more" rules that we can aspire to both as a parents, friends and children of God. Jesus loves you; who am I not to? Rejoice! Again I say REJOICE!! Important lessons I want my daughter (|and any subsequent child) to learn, live by and understand on multiple levels. Honestly, lessons I find myself learning and relearning as the years go by, as I grow as a parent and a human being. 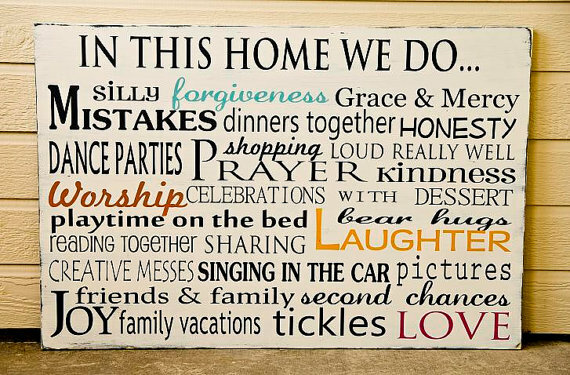 What would you have as your "family Rules"? Should A 5-Year-old own a Mobile Phone? House Work Must Be Split 50/50 ? What Does Your Account Statement Look LIke??? Help! My Wife Can't Cook!!! Forgiveness: Let me tell you a story.